It's much easier to maintain balance if you first find your center. You have big hurdles. We have powerful tools to help you get beyond them! We have a number of tools for you to help incarcerated people prepare to return to the community. We have tools to support you in making informed, careful hiring decisions. 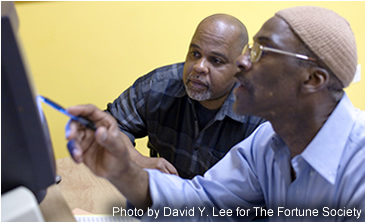 We all play an important role in reentry. JAY-Z and Meek Mill, along with leaders across sports, entertainment, and business industries, have teamed up to launch a new criminal justice reform organization called REFORM Alliance created to change policies and laws regarding probation and parole. Announcing the Revolution Wellness Center website! Everything changes; nothing stands still. Heraclitus made that famous statement more than 2500 years ago and we are still struggling today to embrace difference and change. We are trained – through school, peers and especially the media – to seek ‘right answers’ including using algorithms for reentry, as if the person that was sentenced years ago is the same person today. Some people try not to change much, but as we all know, some people change a lot. We are conditioned to trust certain ‘authorities’ and not others; to value ‘evidence’ from this source but not that one…and to ask peers, relatives and others in our group to tell us which is the real news and which is the fake news. How can we rise above the noise? How can we get a different perspective that could help us see things differently? The Revolution Wellness Center has been created to increase viewpoint diversity and expand inclusivity! It is also the Empowerment Emporium, a store created to donate 100% of it's profits to Fair Shake. Zero Six Eight is a for-profit business incubator with a unique mission. To get in, you have to be an ex-offender or be willing to hire ex-offenders. Zero Six Eight derives its name from the last three digits of ID numbers that identify federal prisoners from the Pittsburgh area. The business is nurturing 10 young startup companies now, as well as its own modular-home building business, Work Pittsburgh. Daniel Bull founded Zero Six Eight after serving 21 months for mail fraud. His position is unpaid; he earns his paycheck as a partner at Canonsburg-based Nello Construction, which supports Zero Six Eight with tools, contacts and insurance. Or click on the link below to see Daniel's TED-x talk inside SCI Chester, a PA state prison. The report in Mr. Loomis’s case was produced by a product called Compas, sold by Northpointe Inc. It included a series of bar charts that assessed the risk that Mr. Loomis would commit more crimes. What can be done to keep people from cycling back into the system? Let's start with jobs. Sustainable employment may be our single best opportunity to significantly reduce recidivism. With the company's vice president, Kenyatta Brame, and Jahaun McKinley, formerly incarcerated and lean manager at Cascade who has been with the company for six years. A cooperative in Puerto Rico's Guayama prison, started in 2003, has helped dozens of incarcerated individuals reduce their sentences and return to their communities. Inmate Gordon Nembhard said "The co-op provides a different point of view. It's not 'me against the world'. It's the co-op and my fellow members working and thinking together. That is transformational." Damon Horowitz teaches philosophy through the Prison University Project. 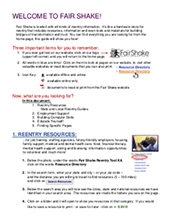 Fair Shake has created several FREE tools exclusively for those coming home. Victor Frankl, author of Man's Search for Meaning shares his perspective on having faith in humanity. Professor Zimbardo shows how ordinary, good people can turn into perpetrators of evil.